It's transforming the way people with diabetes communicate with personal health care teams and treat and manage their disease. As consumers increasingly use technology in their everyday lives to communicate, perform daily living tasks, and seek information, they're expecting their health care services to be readily accessible digitally on their phones and tablets wherever and whenever they want. These newly empowered, engaged, and educated "e-patients" who have diabetes also are increasingly using technology to log and share lifestyle data, keep track of their health status, obtain health information, and become more active participants in their own care. Digital health is the convergence of health care and technology. It has reached a tipping point and is rapidly redesigning clinical care. This article provides an overview of what's driving the trend in digital health supporting diabetes care, the evidence advocating its use, the promising technologies available, and the rapidly evolving role of dietitians as part of the health care team that cares for people with diabetes. Chronic diseases such as diabetes that require regular follow-up and therapy progression can benefit from the integration of technology-based tools. The anytime-anywhere nature of digital technology supports the delivery of automated, individualized coaching, enabling patients to address their health issues by sharing data and connecting with their health care team when needed in between scheduled appointments. The diabetes e-health ecosystem, the use of information and communication technologies for health, as illustrated in Figure 1 on page 41, has expanded well beyond diabetes devices to include personal health devices such as physical activity and sleep trackers, cloud-connected monitoring systems, data management platforms, telehealth services, digital education, mobile apps, digital therapeutics (clinically validated apps), and social media platforms. Health care team members' review of patient-generated health data can lead to more immediate adaptions to the care plan by providing insights for shared decision making and proactive patient-team communication that engages patients in their care with members of the health care team. However, to be of value, digital health tools and the resulting patient-generated health data must be integrated into clinical practice, becoming a critical part of what's done vs merely what's being added. Due to the growing evidence of the efficacy of digital health tools for improving A1c and other diabetes-related outcomes, both the 2017 National Standards for DSMES4 and the 2018 American Diabetes Association Standards of Medical Care5 encourage inclusion of technology-enabled solutions to deliver diabetes care and education. — Source: American Association of Diabetes Educators (AADE) 2016 Technology Workgroup. Based on Architecture for Integrated Mobility Framework (AIM). Reprinted by permission of the AADE. — Source: Greenwood DA, Gee PM, Fatkin KJ, Peeples M. A systematic review of reviews evaluating technology-enabled diabetes self-management education and support. J Diabetes Sci Technol. 2017;11(5):1015-1027. Used with permission of the AADE. Yet, while technology is poised to become a major part of the solution in transforming diabetes care, it remains a rapidly expanding and confusing space. The FDA is focused on digital health with an aim toward fostering innovation, allowing for rapid iterative modifications in digital health products, and streamlining the approval process (see the sidebar "The Evolving Digital Health Regulatory Environment" online for an overview of current regulatory guidance and categories in digital health). Many diabetes technology solutions offer the opportunity to track and visualize data related to daily diabetes care, regarding blood glucose management, food, physical activity, and medications. In some cases, the digital applications provide cloud-based methods of sharing data with others, including health care team members. In most cases, the technology provides minimal data analysis, interpretation, or guidance to patients. Livongo enables users to monitor their blood glucose virtually through a connected blood glucose meter while certified diabetes educators provide real-time coaching if users experience hypo- or hyperglycemia. These virtual interactions to resolve blood glucose excursions often include additional diabetes education relevant to the individual. Educators are available on-demand to users by text or e-mail as needed. OneDrop is a mobile app that offers in-app coaching on blood glucose management by a certified diabetes educator. The app facilitates tracking of blood glucose and diabetes self-management data and includes a digital diabetes education program. WellDoc, a digital therapeutic company, has translated the DSMES curriculum and digitized it to be delivered in an in-app diabetes education curriculum designed for people with type 2 diabetes. The digital curriculum is designed to be completed over 12 weeks, though individuals can choose to progress at their own pace. OnDuo is a virtual diabetes clinic that provides either a connected blood glucose meter or a continuous glucose monitor to facilitate remote monitoring. It offers an app for data tracking and visualization, and virtual diabetes coaching by certified diabetes educators. Individuals can connect with their diabetes coach as needed through text or e-mail. WellDoc's BlueStar, an FDA-cleared, clinically validated digital therapeutic for people with type 2 diabetes, falls within a category of digital health called digital therapeutics. Digital therapeutics are distinguished from health and wellness apps in that they conduct peer-reviewed randomized controlled trials to demonstrate clinical efficacy and safety of the digital therapeutic product, and in many cases they obtain FDA clearance as a mobile medical app. In addition, digital therapeutics enable users to connect with members of their care team, share personal data, and, through two-way communication, partner together to make changes as needed to their care plan. BlueStar provides automated coaching in real time that's tailored to users' treatment and self-management plans, their personal routines and preferences, and the types and timing of data they're sharing either manually or through synced wearables, apps, meters, or trackers. This allows 24/7 support to be provided during the time individuals are navigating the complexities of diabetes on their own. Individuals can share their data with their care teams on a regular schedule or as needed to support collaboration of care. Because of ongoing technological advances, digital diabetes education and care has the potential to transform the role of dietitians. They can become leaders in redesigning care, moving from the fee-for-service approach to value-based payment, as demonstrated in integrated delivery systems, patient-centered medical homes, and accountable care organizations. Diabetes-focused dietitians/educators are the subject matter experts in diabetes care and in the use of patient-generated health data, and therefore can work with other members of the care team as mentors and leaders. 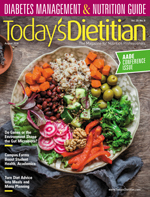 Dietitians can become the distribution channel for placing evidence-based technology tools (digital therapeutics) into the hands of patients to ensure optimal use. 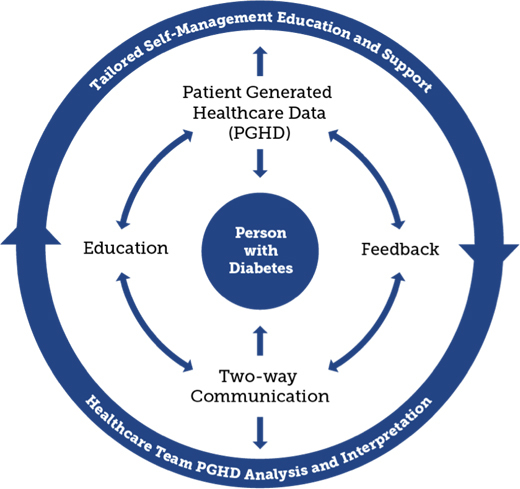 The goal is to connect e-patients with their health care teams through a complete feedback loop to optimize diabetes self-management and treatment. Recognizing the need to keep abreast of the latest technological advances, the AADE is launching a new online diabetes technology training and education website for its members called DANA (Diabetes Advanced Network Access), available at www.danatech.org. DANA is a hub for diabetes educators and other health care providers, as well as the industry, to come together to learn about the latest devices, medications, mobile apps, and technology-focused research so they can serve patients and caregivers more effectively. When DANA is fully released in 2018, it will include resources in four functional areas targeted at a professional health care audience: device training, resource library, education, and evolving and emerging technology. 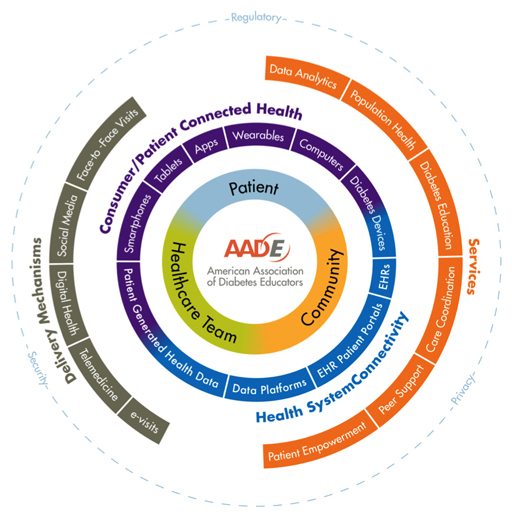 In addition, a Digital Health Learning Network was established as a collaboration between AADE and WellDoc to explore new strategies that will bring innovative tools to the practice of diabetes education and care (see the sidebar "AADE/WellDoc Diabetes Digital Health Learning Network"). As of 2018, Medicare "unbundled" an existing Part B CPT code, 99091, and has begun to pay separately for remote patient monitoring done by qualified providers (eg, physicians, nurse practitioners, physician assistants, and clinical nurse specialists). Providers can be paid approximately $58 for a cumulative time of 30 minutes per month to review biometric data the patient and/or caregiver digitally transmits and communicate the findings and care plan recommendations to the patient and/or caregiver. The Academy of Nutrition and Dietetics is working on getting RDs designated as qualified providers. Learn more about CPT code 99091 at www.cms.gov/Outreach-and-Education/Medicare-Learning-Network-MLN/MLNMattersArticles/Downloads/MM10393.pdf. Technology is transforming health care, including diabetes management. Opportunities are here for practices, health care systems, dietitians, diabetes educators, and other members of the health care team to expand and leverage these tools to improve diabetes outcomes for patients. Diabetes-focused dietitians, with their extensive experience in the practical use of patient-generated health data, patient-centered diabetes care, and self-management training, are uniquely positioned to lead in integrating evidence-based technology tools into clinical practice. The time is now. — Janice MacLeod, MA, RDN, CDE, FAADE, began her career as a diabetes dietitian for Carilion Health System in Virginia and more recently served at the University of Maryland Center for Diabetes and Endocrinology in Baltimore. MacLeod also worked for many years at Johnson & Johnson Diabetes Care, and has served as both author and editor for multiple publications. She has contributed to book and curriculum manuals on diabetes and has developed numerous education programs and presentations in the areas of diabetes nutrition, glucose monitoring, digital health, and practice transformation. * The author reports the following relevant disclosure: She serves as director of clinical innovation at WellDoc, a digital health company in Columbia, Maryland. In her role, she works with health care teams, bringing technology to clinical practice. 1. Gaglio B, Shoup JA, Glasgow RE. The RE-AIM framework: a systematic review of use over time. Am J Public Health. 2013;103(6):e38-46. 2. Kaufman ND, Woodley PDP. Self-management support interventions that are clinically linked and technology enabled: can they successfully prevent and treat diabetes? J Diabetes Sci Technol. 2011;5(3):798-803. 3. Greenwood DA, Gee PM, Fatkin KJ, Peeples M. A systematic review of reviews evaluating technology-enabled diabetes self-management education and support. J Diabetes Sci Technol. 2017;11(5):1015-1027. 4. Beck J, Greenwood DA, Blanton L, et al. 2017 national standards for diabetes self-management education and support. Diabetes Educ. 2017;43(5):449-464. 5. American Diabetes Association. Lifestyle management: Standards of medical care in diabetes — 2018. Diabetes Care. 2018;41(Suppl 1):S38-S50. 6. One Drop | Experts becomes the first digital diabetes education program recognized by the American Diabetes Association. One Drop website. http://onedrop.today/2017/04/18/one-drop-experts-becomes-the-first-digital-diabetes-education-program-recognized-by-the-american-diabetes-association/. Published April 18, 2017. Accessed April 24, 2018. 7. Pennic F. Livongo for Diabetes named first telehealth program to receive AADE accreditation. HIT Consultant website. http://hitconsultant.net/2015/08/05/livongo-diabetes-first-telehealth-program-aade-accreditation/. Published August 5, 2015. Accessed April 24, 2018. 8. WellDoc, American Association of Diabetes Educators. WellDoc and AADE partner to incorporate AADE diabetes self-management education curriculum into the BlueStar digital therapeutic platform. https://www.welldoc.com/images/uploads/WellDoc_AADE_PressRelease_FINAL.pdf. Accessed April 24, 2018. 9. Levine B, Brown A. Onduo delivers diabetes clinic and coaching to your smartphone. diaTribe website. https://diatribe.org/onduo-delivers-diabetes-clinic-and-coaching-your-smartphone. Published March 12, 2018. Accessed April 24, 2018. 10. MacLeod J, Peeples M. Are you ready to be an eEducator? AADE in Practice. 2017;5(5):30-35. 11. Improvement activities requirements. Quality Payment Program website. https://qpp.cms.gov/mips/improvement-activities. Accessed April 24, 2018. It's estimated that 77% of Americans now own smartphones. By 2022, the penetration of smartphone use is estimated to reach 80% of the US population. Nearly 80% of US adults own desktop, laptop, or tablet computers. There are 200 new health-related apps introduced each day. Currently, 314 wearables are available. Out of the 318,000 apps on the market, 41 account for one-half of all downloads. Sixteen percent of disease-specific apps target diabetes. 1. Mobile fact sheet. Pew Research Center website. www.pewinternet.org/fact-sheet/mobile/. Updated February 5, 2018. Accessed April 24, 2018. 2. The growing value of digital health: evidence and impact on human health and the healthcare system. IQVIA Institute for Data Science website. https://www.iqvia.com/institute/reports/the-growing-value-of-digital-health. Published November 7, 2017. Accessed April 24, 2018. 1. Mobile Wellness Apps: No regulatory oversight is required for these health and wellness apps. The vast majority of apps are in this category. tools that automate simple health care providers' tasks. 3. Mobile Medical Apps Connected to a Class 2 Medical Device: The few apps in this category require FDA oversight because they're intended to be used as an accessory to already regulated medical devices or transform a mobile platform into a regulated device. Precertification Program. A pilot program looking to certify companies that demonstrate good quality and regulatory compliance in product development, thus not requiring review of each iteration of their products (certifying companies vs their individual products). Entrepreneurs in Residence. The FDA is recruiting a team of entrepreneurs to help identify requirements and offer input for a new digital health paradigm. Clinical Decision Support Guidance. The FDA issued draft guidance on clinical decision support software in 2017. For more information visit www.fda.gov/MedicalDevices/DigitalHealth/MobileMedicalApplications/default.htm. A Diabetes Digital Health Learning Network was established in August 2017 as a collaboration between the American Association of Diabetes Educators (AADE) and WellDoc, a digital therapeutic company and the developer of BlueStar, an FDA-cleared, clinically validated digital therapeutic for people with type 2 diabetes. The intent of the network collaboration was to provide opportunities for diabetes educators to collectively develop and share best practices for implementing a clinically validated digital health therapeutic into a variety of practice settings. Educators explored taking on new roles, including population health management, use of patient-generated health data to identify and resolve self-care barriers, and partner with patients and other health care team members to optimize care plans in a timely manner. The group also discussed opportunities to improve care delivery and practice efficiency, including the potential for diabetes educators to leverage technology to position themselves as valued leaders in evolving care and payment models. building the case for payment transition from fee-for-service to value-based. To learn more about the network and opportunities in which to get involved, contact Janice MacLeod at jmacleod@welldocinc.com.